Good Leaders: Why do you volunteer? "I've discovered I feel so much better about myself when I spend time helping others," the man quoted in the article professed. It's the law of Karma, and reciprocity: when we put out helping energy into the world, it comes back to us in amazing ways. At Good Leadership Enterprises, we believe goodness pays. We call helping others: living generously. And I know it pays. Good Leaders: How are you living your mission? With two toddlers and a recent promotion, Sara Koch’s life as a good leader is sometimes overwhelming. At Lutheran Social Service, Sara oversees seniors who volunteer to support other seniors and children around the Twin Cities. One day, Sara asked one of those volunteers, an elderly woman from the Soviet Union, what motivates her. Good Leaders: How could a new weekly routine help you? Good Leaders: What rejuvenates you? We all need a personal strategy to de-stress. 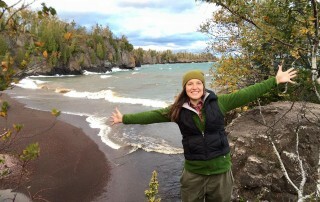 For Katie French, Administrative Fellow at Regions Hospital, her sanctuary is in nature - and while she’s out there, she’s frequently thinking about how to keep improving her Seven Fs Wheel. Good Leaders: Are you creating the life you want? Good Leaders: Who is helping you reach the next level? We all have a vision for our lives; some more vivid than others. Whether peering into our 80's, 50's or 30's, we are all imagining a richer, happier existence filled with new possibilities and goodness. But nothing significant ever happens alone - who is helping you reach the next level? Good Leaders: How are you Rewarding Excellence? Good Leaders: Who do you feel accountable to? Good Leaders: How are you helping others grow? Good Leaders: What’s your plan to help yourself grow?